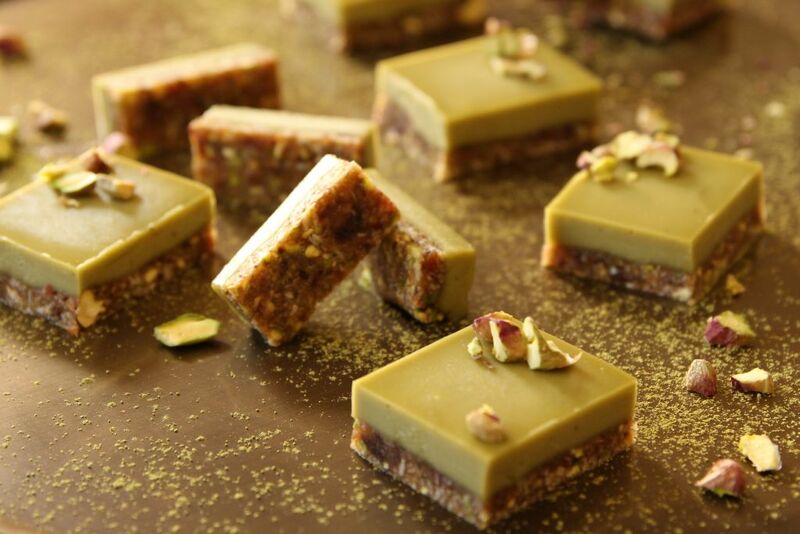 No Bake Matcha Slice Bars With Pistachios! 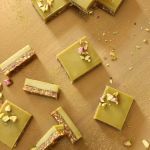 Before we dig into these delicious matcha slice bars, I wanted to share with you, how I was inspired to make them. The first time I saw a matcha dessert, was when I was on vacation in Paris, a few years ago, with my hubby. While exploring the city, a Japanese Patisserie mesmerized me, and knew I had to get a better look. Inside, there were the most exquisite, and unique desserts I had ever seen. But what caught my eye was an opera matcha cake, modelling in the glass vitrine. It looked stunning, almost too good to eat. So, I decided it was about time I created a matcha dessert of my own. I knew I wanted it to be as raw as possible, and instantly thought of my recent slice bar creations. Well, after only 2 attempts, I was blown away by the results. Add the medjool dates, pits removed, into a food processor, and blend until it’s a paste. Add the pistachios, and shredded coconut, and blend, until combined. Transfer the mixture into an 8 x 4 x 1/2-inch loaf pan (20 x 10 x 6 cm), that’s lined with baking paper, and with your fingers, form an even base, then set it aside while we make the filling. For the matcha filling, add an inch (2.5 cm) of water, into a small pot, bring to a boil, then take it off the heat, and place a heat proof, glass bowl, on top. Next, place the coconut oil into the bowl, to gently melt, then add the almond butter, maple syrup, vanilla essence, lemon juice, and coconut cream, and whisk, until combined. Finally, add the matcha powder, and give it a quick whisk. 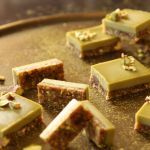 Blend the matcha filling, with a hand blender, to emulsify the mixture, then pour it on top of your pistachio base, and with a spatula, smooth it out. If needed, gently jiggle the tray, and tap it to release any unwanted air bubbles. Pop them into the freezer for an hour, or until set. To cut these heavenly delights, dip a chef’s knife into a glass of hot water, dry it, and cut into 9 bars, or desired size. Repeat this step with every cut, to ensure a nice, clean finish. Want another refreshing freezer snack to indulge in? 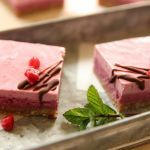 Then you should try my raw Raspberry Slice bars! They’re fresh, fruity, a piece of cake to make, and taste exceptional. ← Vegan Seed Crackers With Lots Of Goodness! Matcha is an acquired taste that I’m not sure if I’ve acquired yet! I think I’d enjoy it a lot more in a slice like this, it looks and sounds delicious! wow your photo’s look great! I love matcha so will have to try these. Paris is food Inspiration heaven! Love it there! Wow, these look amazing, Elinor! I love matcha so much (I first discovered it when I lived in Thailand). 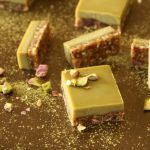 I definitely have to make these… and the beauty of it will be that I’ll get to have them all to myself because K hates matcha! Ha ha ha! Thanks Nico! Mmmm, Thailand is just such a magical place!